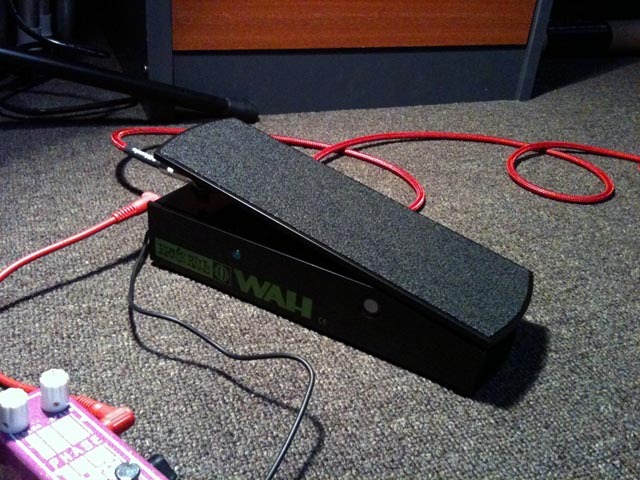 My New Ernie Ball Wah Pedal, thanks to Jemsite for awarding me with it. Today, thanks to Jemsite, I received an Ernie Ball Wah Pedal in the mail. I was awarded it for my gear reviews published on Jemsite. This looks like a very cool wah, nice and solid, true bypass wiring, and extremely smooth operation. I’ve never owned an actual wah pedal, although I’ve played a few of them, and used the wah patches on a couple of modellers. My initial thoughts on the Ernie Ball Wah is that it is a great sounding wah that never gets too shrill in the higher range of the sweep, and the control is so nice and smooth. The bypass switch is easy to engage, and only requires a nice small amount of pressure to operate. A big thanks goes to Brian Ball at Ernie Ball for providing the Wah pedal to Jemsite, and of course a big thanks to Jemsite for awarding me with it. I’ll have a review up here soon for it.